Western blot analysis of whole cell lysates probed with actin beta antibody (VMA00014) followed by detection with HRP conjugated Goat anti Human F(ab')2 (1/2500, STAR126P) and visualized on the ChemiDoc MP with 1 second exposure. Arrow points to beta actin (molecular weight 42 kDa). Actin beta antibody recognizes cytoplasmic actin beta, also known as beta-actin, or cytoplasmic 1. The antibody has been extensively validated for western blotting using whole cell lysates. Human anti Human actin beta antibody recognizes the product of the ACTB gene, cytoplasmic actin beta, also known as actin cytoplasmic 1. Actin beta is ubiquitously expressed in all eukaryotic cells, playing a critical role in cell survival, motility and re-modelling. Actin beta is highly conserved throughout evolution, with all vertebrate and invertebrate species reviewed to date bearing a 98% or greater amino acid primary sequence identity to human actin beta. Plant species also exhibit a high degree of primary sequence conservation displaying considerable similarity to animal actin beta. For example, nearly 90% sequence identity is observed between the human ACTB and the model plant species Arabidopsis thaliana (mouse eared cress) ACT1 (Arabidopsis) gene products. Actin beta is a commonly used western blotting loading control for cell and tissue lysates across many species due to its ubiquitous expression and evolutionary conservation rendering antibodies against this target cross reactive with protein preparations from many different organisms. Human anti Human actin beta antibody recognizes human actin beta as a single band of ~42 kDa in multiple human and rodent cell line lysates by western blotting under reducing conditions. Anti actin beta antibody detects a band of approximately 42 kDa in HeLa cell lysates. A bivalent human recombinant Fab selected from the HuCAL® GOLD phage display library, expressed in E. coli. This Fab fragment is dimerized via a helix-turn-helix motif. The antibody is tagged with myc-tag (EQKLISEEDL) and a double extended Strep-tag at the C-terminus of the antibody heavy chain. This product is supplied as a liquid. Sold under license of U.S. Patents 6753136, 7785859 and 8273688 and corresponding patents. 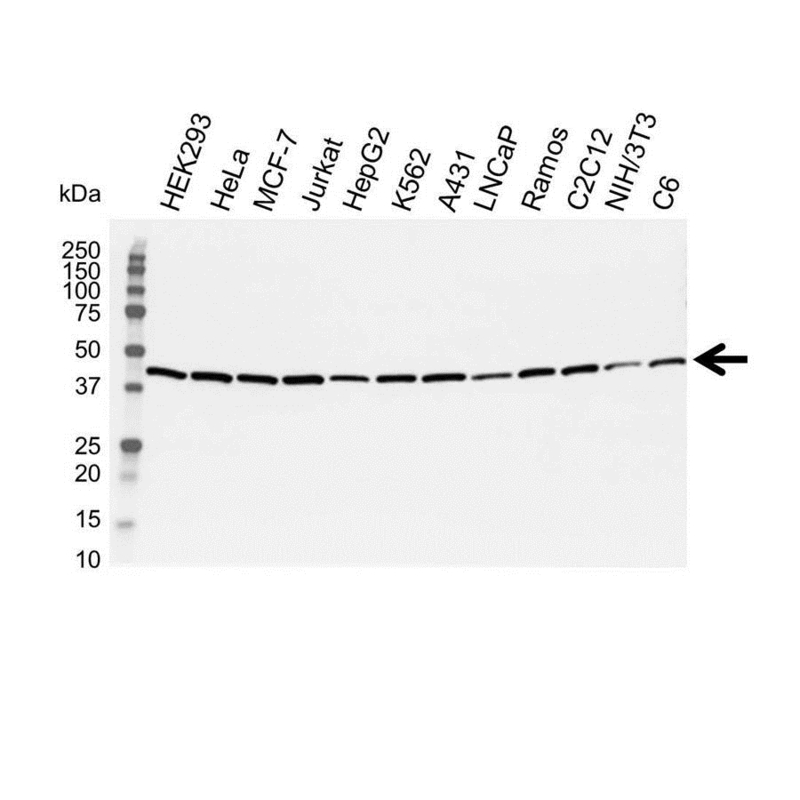 This antibody was developed by Bio-Rad, Zeppelinstr. 4, 82178 Puchheim, Germany. PrecisionAb™ is a trademark of Bio-Rad Laboratories.